Layer the first 5 ingredients in a food processor. Pulse until the mixture resembles coarse crumbs. Add the water and pulse until the mixture forms a ball of dough. Remove the dough from the processor and pat into a circle onto plastic wrap. Wrap and refrigerate for 20 minutes. Roll chilled dough onto a floured surface until ⅛ inch thick. 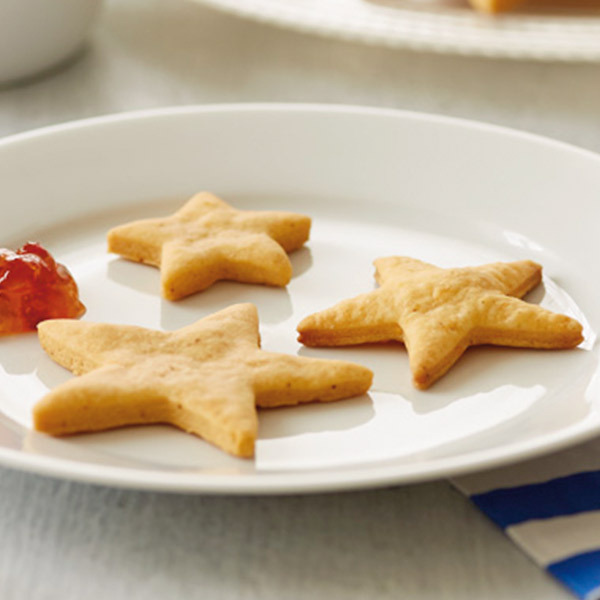 Cut star shapes with the cookie cutter. Dip cutter in flour to prevent sticking, if necessary. Bake stars on parchment-paper-covered baking sheets 15 to 18 minutes or until crisp.